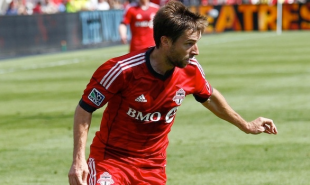 Philadelphia native and Toronto F.C. midfielder Bobby Convey provided our locals’ only goal of the week in Saturday’s League Basement Battle with D.C. United. Down 1-0 early in the game thanks to a spectacular goal from Dwayne De Rosario, things were looking hopeless for Toronto’s lackluster attack. In the 60th minute, out of seemingly nowhere, a poor clearance by United defender Dejan Jakovic allowed Toronto winger Reggie Lambe to send a strong cross into the box that found Convey making the secondary run. Convey netted the equalizer with a neat finish to score his first goal of the season and save the Reds from another loss on the road. Bobby Convey, M, Toronto FC — Started and played 90 minutes in Saturday’s 1-1 draw at D.C, scoring a goal in the 60th minute. Season: 17 games, 15 starts, 1 goal, 3 assists. Ryan Finley, F, Columbus Crew — Played 16 minutes in Saturday’s 4-0 loss at Real Salt Lake. Season: 7 games. U.S. Open Cup: 0 games. Antoine Hoppenot, F, Philadelphia Union — Played 10 minutes in Sunday’s 5-1 loss at New England. Season: 23 games, 1 start, 3 goals, 1 assist. U.S. Open Cup: 1 game. Jeff Larentowicz, M, Chicago Fire — Started and played 90 minutes in Friday’s 1-0 win over Kansas City. Season: 23 games, 22 starts, 1 goal, 4 assists. U.S. Open Cup: 3 games, 1 start. Jeff Parke, D, Philadelphia Union — Started and played 90 minutes in Sunday’s 5-1 loss at New England. Season: 23 games, 23 starts, 6 clean sheets. U.S. Open Cup: 2 games, 2 starts. Andrew Wenger, F, Montreal Impact — Did not play. Season: 14 games, 6 starts, 1 goal, 3 assists. Canadian Championship: 4 games, 4 starts, 1 goal. Greg Cochrane, D, Los Angeles Galaxy — Did not play. Tournament: 0 games. Dan Gargan, D, San Jose Earthquakes — Next game scheduled for August 28, 2013. Tournament: 1 game, 1 start, 0 clean sheets. Marcus Tracy, F, San Jose Earthquakes — Next game scheduled for August 28, 2013. Tournament: 0 games. Andrew Wenger, F, Montreal Impact — Played 10 minutes in Wednesday’s 1-0 loss at CD Heredia. Tournament: 1 game. Hunter Gorskie, D, New York Cosmos – Started and played 90 minutes in Saturday’s 2-1 win over San Antonio. Season: 3 games, 3 starts, 1 clean sheet. Pat Hannigan, GK, San Antonio Scorpions — Started and played 90 minutes in Saturday’s 2-1 loss to New York. Season: 9 games, 9 starts, 16 goals against. U.S. Open Cup: 0 games. Corey Hertzog, F, FC Edmonton — On loan from Vancouver, started and played 90 minutes in Sunday’s 1-1 draw at Tampa Bay. Season (Edmonton): 3 games, 3 starts, 1 goal. Season (Vancouver): 7 games, 6 starts, 1 goal, 1 assist. Canadian Championship (Vancouver): 2 games, 1 goal. Jeremy Vuolo, GK, San Antonio Scorpions — In the 18, but did not play. Season: 6 games, 5 starts, 7 goals against. U.S. Open Cup: 0 games. Cristhian Hernandez, M, Harrisburg City Islanders — In the 18, but did not play. Season: 19 games, 14 starts, 4 goals, 4 assists. U.S. Open Cup: 1 game, 1 start. Jimmy McLaughlin, M, Harrisburg City Islanders — Played 90 minutes in Saturday’s 3-1 loss to Charlotte. Season: 23 games, 7 starts, 5 goals. U.S. Open Cup: 1 game, 1 start. Jason Yeisley, F, Richmond Kickers — Did not play. Season: 12 games, 11 starts, 1 goal, 2 assists. U.S. Open Cup: 1 game, 1 start. Jon Okafor, M, MYPA — Started and played 80 minutes in Sunday’s 2-1 loss at HJK. Season: 23 games, 13 starts, 2 goals, 1 assist. Alex DeJohn, D, Ekenäs IF — Started and played 90 minutes in Saturday’s 4-1 win over KaPa. Season: 18 games, 18 starts, 8 clean sheets. Russell Canouse, M, Hoffenheim — Did not play. Season: 1 games, 1 start. Zach Pfeffer, M, Hoffenheim — Did not play. Season: 0 games. Zarek Valentin, D, FK Bodø/Glimt — Started and played 45 minutes in Sunday’s 2-0 win over Mjøndalen IF. Season: 18 games, 18 starts, 10 clean sheets. Cup: 3 games, 3 starts, 1 clean sheet. Billy Schuler, M, Hammarby IF — Did not play. Season: 10 games, 7 starts, 1 goal. Bobby Warshaw, M, Ängelholms FF — On loan from FC Dallas, in the 18, but did not play. Started and played 90 minutes in Wednesday’s 3-1 Swedish Cup win over Skövde AIK. Season (Ängelholms FF): 0 games. Cup (Ängelholms FF): 1 game. Season (Dallas): 8 games, 1 start. Anthony Allison, F, Umeå FC — In the 18, but did not play. Season: 14 games, 12 starts, 2 goals, 1 assist.